Join the Fredericksburg Theater Company as they celebrate another season. 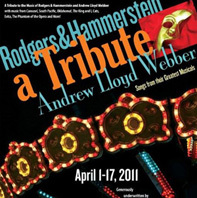 FTC’s production will be “A Tribute to the Music of Rodgers & Hammerstein and Andrew Lloyd Webber” at the Steve W. Shepherd Theatre, 1668 Highway 87 South. Expect to hear your favorite show tunes in this concert filled with their greatest songs from Carousel, South Pacific, The King and I, Cats, Evita, The Phantom of the Opera, Sunset Boulevard, Aspects of Love and more. All performances are on Fridays and Saturdays at 7:30pm and Sundays at 2:00pm. Call (830) 997-3588 for details.